could you enter the ranking of the best 30? This is the wrong section for that, this section is for buying or selling. If your not buying or selling then your post is in the wrong section. You can rank them using different criteria. 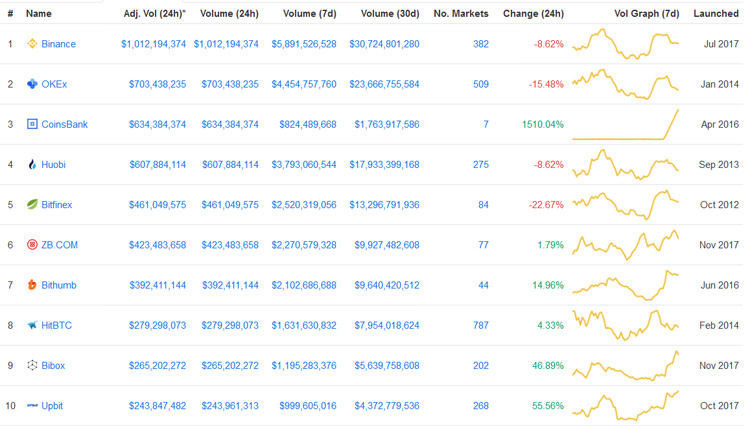 Probably the most natural way would be to rank them by volume (in fact, CoinMarketCap.com does that already for us). You can check the full top 30 or top 100 list on their site. The list is based on 24 hours Adjusted Volume. Could you enter of the best Exchange rank 30? The prandex is the next big move in cryptocurrency exchange, which is the fast evolving crypto to crypto exchange. Yes, no spam please. And about the security of the exchangers?